Baltimore: Is It a Set-up? Something is not right. I can feel it down to my core. I know that by saying out loud what I think I will be branded a kook and conspiracy theorist, but things are just not adding up. I completely agree with Erik Rush in his WND column of last week when he lays out his theory on why we are facing such turmoil. I don’t think the chaos in Baltimore “just happened”; I think it was planned and is the next step in the breakdown of our society. I’m not saying that Freddie Gray, the 25 year old African-American man who died at the start of this was responsible; he was just the catalyst that the anarchists needed. He was the spark that ignited the flames. This is not new. The playbook for inciting riots and racial division has been followed for years, definitely at a slower pace than we are seeing today – but now the final chapters are being read, and the climax is imminent. Ever since the election of Barack Obama, racial tensions have ramped up. He was supposed to be the one to unite all Americans and heal the divide, but instead, he did everything he could to turn the heat up and make sure the divide became wider. He surrounded himself with racially divisive people in his administration like Attorney General Eric Holder. He inserted himself into every controversy that had a racial component, like the incident in July of 2009 with the Cambridge police, the Trayvon Martin case, Ferguson and more. And whether right or wrong, even before evidence was presented, he always took the side of the African-American. It became obvious that his concern was not for all Americans but a select few. In an attempt to show “African-Americans” that he cared, he instead succeeded in tearing off the scab of old wounds from the 1960s and fanning the flames of hate for the police. Once the seeds were planted again, he teamed up with Al Sharpton who became a regular at the White House. Certainly their meetings were not about how to heal the divide after each racial crisis, because the rhetoric Sharpton spewed was a call to war! Marxist and former member of the Nation of Islam Malik Shabazz turned up at rallies and fed the crowds more and more about the injustice against blacks and how the police single them out for arrests, beatings and murder. Everywhere that you turned, the mantra was the same: ALL police are bad, and we need to stop them any way that we can. We saw in Baltimore last week a continuation of what began in Ferguson last summer. Ferguson was a warm up, with rioters coming in to the community from other towns and states. Organized by anarchists on social media, young people came out and followed the direction of their leaders to destroy and cause chaos. It worked, and Ferguson went up in flames; but when the flames were doused and the smoldering ruins were left behind, the organizers of this chaos moved on and waited for their next chance to make an even bigger statement. That opportunity came with the questionable arrest of Freddie Gray and the murky details surrounding his death. The leaders of chaos rushed to take advantage of that situation and all hell broke loose. I am still at a loss as to why the Baltimore police and the civic leaders were not prepared for a possible conflict when they had a week to prepare for it. Freddie Gray did not die in the police van or even at the hospital that same day; it was a week later – yet everyone was caught flatfooted. Why? Why were the police not allowed to wear more protective gear when the violence started? Why did the mayor stand up and say that the city was giving “those who wished to destroy a place to do that”? 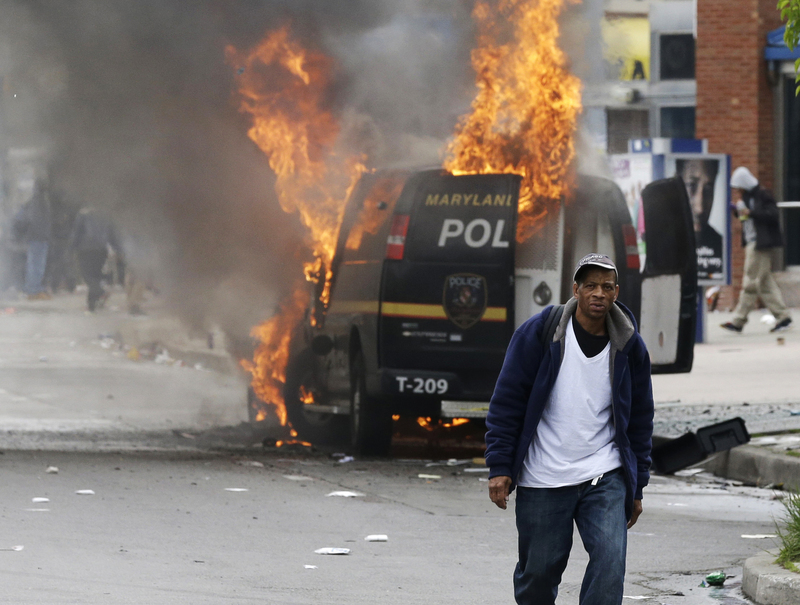 Why were the police told to “stand down” and just watch Baltimore burn? There was not even time to learn any of the evidence before Al Sharpton emerged, and within 24 hours State’s Attorney Marilyn Mosby took to the microphone with what was basically closing statements in the trial of the officers. The charges that were filed against these officers were so overreaching that it would be almost impossible to prove them. Again, I ask, why? She had to know that this was overreach. She is a smart woman. Many believe that she just wanted to appease the people of her community and stop the riots, but within the justice system, that makes no sense. Crazy? Maybe, but we are on the edge in this country. Attacks are coming from all sides, from inside and outside of our borders, and we are becoming overwhelmed. What happens when Baltimore spreads across the country and our television screens show four or five cities burning at once? Who will we turn to at that point? “One Nation under God” – we need Him now more than ever.